Benzodiazepines belong to the hypnotic-sedative class of drugs which have anxiolytic, sedative, and hypnotic properties. These drugs have been in clinical use for at least half a century. The propensity for development of dependence, especially on prescription benzodiazepines, coupled with the risk of falls and cognitive impairment due to benzodiazepines makes the elderly population susceptible to adverse outcomes with the use of benzodiazepines, and hence, cautious use is desired in this population. This review discusses the various aspects pertaining to benzodiazepine abuse in the elderly including pharmacology, prevalence of abuse, adverse consequences of benzodiazepine abuse, and subsequently assessment and management of elderly patients with benzodiazepine abuse. Benzodiazepines belong to the hypnotic-sedative class of drugs. They have anxiolytic, sedative, hypnotic, anticonvulsant, and amnesic properties owing to their action on the gamma amino butyric acid (GABA) receptors in the central nervous system. After the serendipitous discovery of the molecule chlordiazepoxide in 1955, benzodiazepines quickly became widely prescribed drugs. This happened due to them being less toxic than barbiturates and a safer choice than the other sedative agents being used at the time. , However, in the 1980s, concern regarding abuse of benzodiazepines grew and this led to formulation of guidelines and even legislation so as to regulate prescription of benzodiazepines. One section of population who was noted to be particularly vulnerable to the risks associated with benzodiazepines use was the elderly. The propensity for development of dependence, especially on prescription benzodiazepines, coupled with the risk of falls and cognitive impairment due to benzodiazepines makes the elderly population susceptible to adverse outcomes with the use of benzodiazepines. This review discusses the various aspects pertaining to benzodiazepine abuse in the elderly including pharmacology, prevalence of abuse, adverse consequences of benzodiazepine abuse, and subsequently assessment and management of elderly patients with benzodiazepine abuse. GABA is the most common inhibitory neurotransmitter in the central nervous system. GABA neurotransmission plays an important role in modulating the excitatory activity of the brain. Benzodiazepines act as positive allosteric modulators predominantly on the GABA type A (GABA-A) receptor. The GABA-A receptor is a ligand-gated chloride-selective ion channel and it is made up of 5 subunits (2 α, 2 β, and 1 γ). Benzodiazepines bind to a pocket between α and γ subunits and induce conformational changes in the receptor that leads to increased binding of GABA to the receptor and increased chloride channel activity. Chronic usage of benzodiazepines leads to lowered GABA receptor activity and alters the activity of other neurotransmitters in the brain as well. , Evidence suggests that age is associated with greater sensitivity of GABA receptors to benzodiazepines. , Due to aging, certain structural and functional changes occur in the brain, such as neuronal loss, reduced density of dendritic synapses, glial cell proliferation, and reduced intercellular enzymes. These changes might be the causes of greater sensitivity of the aging brain to the effects of benzodiazepines. Pharmacokinetics of benzodiazepines in elderly depends on certain age-related and drug-related factors. [Table 1] illustrates the various age-related changes and their pharmacokinetic implications. ,, Drug's route of administration (oral, sublingual, intranasal, intravenous, intramuscular, or rectal), lipid solubility, plasma protein binding, and molecular size are the drug-related factors that determine the volume of distribution of the drug. Most benzodiazepines are rapidly absorbed orally and the more lipophilic molecules cross the blood-brain barrier to quickly exert central nervous system effects. Termination of effect of benzodiazepines takes place due to redistribution of the drug to peripheral tissue. Metabolism of benzodiazepines takes place in the liver by oxidation and conjugation with glucuronide prior to excretion in urine. Cytochrome enzymes such as CYP 3A4, CYP 2E1, and CYP 2C9 catalyze the oxidation reactions. Since several drugs can alter the activity of these cytochrome enzymes, polypharmacy in geriatric population often leads to adverse drug-to-drug interactions. Some benzodiazepines have a significantly longer duration of action due to various active metabolites that have half-lives (for example, nor-diazepam has half-life of 50-180 h). Accumulation of these longer acting metabolites due to impaired hepatic metabolism, renal insufficiency, and other pharmacokinetic disturbances could lead to toxicity. Due to these factors, the ideal method of prescribing benzodiazepines in elderly is to "start low and go slow." Further, drugs with a shorter half-life and those that do not undergo oxidative metabolism (e.g. lorazepam, temazepam) may be preferred. Thus, the duration of action and potency of action determine the safety profile of benzodiazepines. 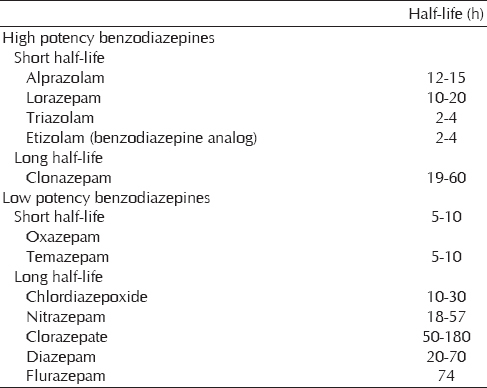 [Table 2] classifies the benzodiazepines according to these parameters into high-potency and low-potency benzodiazepines, which determine their clinical profiles. Benzodiazepines are prescribed in different dose ranges for different indications. The high-potency, short-acting drugs are used on a short-term basis to treat panic disorder, anxiety, and insomnia. Long-acting agents are useful for initial management of anxiety, insomnia, and treating epilepsy. They are the preferred agents for alcohol and sedative/hypnotic withdrawal. It has been remarked that benzodiazepines have a tendency of being abused. , It has been suggested that drugs with high potency and short half-lives have a higher likelihood of being abused. The drugs with high potency include alprazolam, lorazepam, and clonazepam while those of low potency include oxazepam, temazepam, chlordiazepoxide, nitrazepam, and diazepam. Duration of use and individual-related factors are the other characteristics that determine abuse potential of benzodiazepines. There are four important determinants of abuse potential of sedative-hypnotic agents:  Strong euphoric or mood altering effects; tolerance to primary therapeutic effect; rapid onset and rapid termination of action; and presence of withdrawal symptoms upon dose reduction or drug discontinuation. Benzodiazepines have been prescribed among the elderly population primarily for its anxiolytic and hypnotic properties. There are extensively used in geriatric psychiatry, and they are popular because they can be used on an immediate basis to quell panic attacks, intermittent anxiety symptoms, and for acute management of insomnia. , An observation of benzodiazepines use trends during the period 2001-2010 among geriatric age group attending emergency clinics in the USA shows that benzodiazepines use has been consistent among this age group during the decade. Its use has increased from 8.9% to 19.3% among those aged 85 and above. Trend reports from Australia of the 20-year period between 1992 and 2011 indicate a 29.4% drop in the quantity of benzodiazepines utilized during this period. Records indicate an increase in number of pills prescribed per prescription and an increased prescription of alprazolam. Another study that recorded trends of benzodiazepine use among general Australian population during the period 2003-2006 reported a 2% decline in benzodiazepines use during this time. Both these studies reported a high use of benzodiazepines among the population aged more than 65 years, with the highest consumption being by those aged more than 85 years. The older age group reportedly uses a higher quantity of hypnotics. A systematic review of epidemiological data explored long-term use of benzodiazepines in Europe for the period 1994-2014. It shows the overall long-term prevalence of benzodiazepines use to be 3% in the general population. The estimates are dramatically higher for the elderly population (47%) and it often exceeds the daily-recommended dosages in this group. A longitudinal observation of benzodiazepine use trends in a city in the UK showed that those aged between 60 and 70 years had 10%, 6%, and 7% rate of episodic, recurrent, and chronic use of benzodiazepines, respectively. The chronic users of benzodiazepines had significant cognitive decline. An observational study recorded inappropriate benzodiazepine use in Norway's geriatric population aged 70-89 years during the year 2008. Inappropriate use was quantified as anxiolytic benzodiazepine use/hypnotic Z-drug use for more than 30 weeks or hypnotic benzodiazepines use exceeding 300 daily drug dosage for the year or 9 daily drug dosage per week. Widespread inappropriate usage was recorded among 25% of anxiolytic benzodiazepine users, 100% of hypnotic benzodiazepine users, and 65% of Z-hypnotic users. The prevalence was 12.3% in the elderly source population. An assessment of chronic benzodiazepine use among elderly people in Belgium shows that the actual daily dose of both anxiolytic and hypnotic benzodiazepines more often than not exceeds the geriatric upper age limit. A cross-sectional assessment of sedative drug usage among a randomized community sample of elderly people from Finland shows the use of more than one sedative agent by 29% of the sample. Two or more sedative agents are more likely to be used by females, more by those with impaired functioning and psychological problems. Systematic reviews and meta-analyses have attempted to collate the data on the risk and benefit of benzodiazepines in the elderly. Glass et al. analyzed data from 24 studies and found that while sleep quality improved, there was increased risk of cognitive impairment (odds ratio [OR] of 4.78), psychomotor impairment (OR 2.61), and daytime fatigue (OR 3.82) with benzodiazepines as compared to placebo. A meta-analysis of 10 studies by Sithamparanathan et al. suggested that risk of adverse effects due to benzodiazepines use among elderly people found to be 2.45 times than in general population. Hartikainen et al. found that the benzodiazepines were a prominent risk factor for falls among the elderly. Barker et al. analyzed 13 studies assessing the neuropsychological effects of benzodiazepine use and found that long-term use of benzodiazepines was associated with neuropsychological deficits. The effect sizes of score deficits on neuropsychological tests ranged from −1.30 to −0.42. Billioti de Gage et al. reported an increased risk of dementia with benzodiazepines, risk being greater for longer acting molecules, greater duration of treatment, and higher dosages. Several recent large-scale studies have attempted to find the relationship between benzodiazepine use and occurrence of dementia. , While benzodiazepine use was found to be associated with slightly higher rates of developing dementia, a dose-response relation was not found and higher doses of benzodiazepines were not associated with increased rates of dementia. Another follow-up study on similar lines suggested that benzodiazepine use was associated with about 10% increased rates of developing dementia,  and the risk of dementia was higher with benzodiazepines with longer half-lives as compared to benzodiazepines with shorter half-lives. Several mechanisms have been proposed to underlie the increased risk of development of dementia in patients with benzodiazepine dependence:  astrocytes in the area of amyloid plaques could have GABA-secreting activity, making patients with predementia lesions more vulnerable to cognitive effects of benzodiazepines, and lowering the neural compensation and cognitive reserve for coping with initial neurological lesions using/developing alternative networks. Recreational benzodiazepines abusers: Elderly with recreational use of benzodiazepines usually have comorbid substance use disorders. Ignoring multiple substance use among the elderly can have serious consequences due to chronic use and due to inadequate withdrawal management. Keeping in mind the adverse outcomes associated with prolonged benzodiazepine use and the known determinants of abuse, various patterns of abuse found among elderly population certain guidelines need to be followed while prescribing benzodiazepines to the elderly. 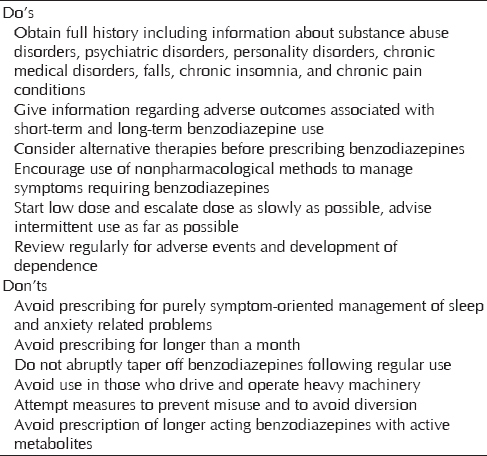 [Table 4] outlines the do's and don'ts of prescribing of benzodiazepines. Following these could help in rational use of benzodiazepines in the elderly and avoid the occurrence of benzodiazepine dependence. Research on aspects related specifically to management of benzodiazepine abuse in the elderly is limited. Lack of validated screening tools prevents inclusion of the at-risk population into treatment. Management of acute withdrawal symptoms is an important part of treatment plan for those dependent on benzodiazepines. Management begins with an assessment of the elderly patient for signs of abuse/dependence and presence of other psychiatric, physical, substance use-related comorbidities through clinical history taking and a thorough physical and mental state examination. , As a screening tool, Alcohol, Smoking and Substance Involvement Screening Test is useful to look for drug misuse by the elderly. Necessary laboratory-based and radiological investigations should be carried out. This is followed by therapeutic interventions for withdrawal symptoms and long-term management. [Figure 1] provides a basic outline of management. Management of acute withdrawal symptoms is an important part of treatment plan for those dependent on benzodiazepines. Nonpharmacological interventions also include interventions to prevent maladaptive behaviors such as increased alcohol/other psychoactive substance use and use of other sedative/hypnotic agents (Z-drugs, barbiturates). Long-term strategies include using better alternatives to manage symptoms of anxiety and insomnia for which benzodiazepines might have begun to be prescribed in the first place. Benzodiazepine use is quite frequent among the elderly population. They are popular as anxiolytic and hypnotic agents. Commonly, use among the older adults usually begins with a prescription and which then could lead to inappropriate use. The adverse effects due to benzodiazepines use are higher in the geriatric population due to age-related pharmacokinetic and pharmacodynamic changes that occur in the body. Polypharmacy and presence of comorbid medical disorders among the geriatric population also play a part in causing complications due to benzodiazepines use among the elderly. Thus, their use is no longer recommended among the geriatric population. The adverse effect profile of benzodiazepines in older people includes cognitive and motor impairment. Management of withdrawal symptoms caused due to termination of benzodiazepines use involves tapering of the benzodiazepines and/or use of adjuvant medication. Nonpharmacological interventions play an important role in withdrawal management. Long-term pharmacological and nonpharmacological therapy is essential for treating the anxiety and insomnia that chronic users of benzodiazepines have to deal with. Clinicians should exercise caution when prescribing medications to the elderly and monitor use of benzodiazepines to look for adverse effects and misuse of the drug. Greenblatt DJ, Miller LG, Shader RI. Neurochemical and pharmacokinetic correlates of the clinical action of benzodiazepine hypnotic drugs. Am J Med. 1990;88:18S-24S. Lader M. History of benzodiazepine dependence. J Subst Abuse Treat 1991;8:53-9. Wick JY. The history of benzodiazepines. Consult Pharm 2013;28:538-48. Tannenbaum C. Inappropriate benzodiazepine use in elderly patients and its reduction. J Psychiatry Neurosci 2015;40:E27-8. Mody I, De Koninck Y, Otis TS, Soltesz I. Bridging the cleft at GABA synapses in the brain. Trends Neurosci 1994;17:517-25. Pirker S, Schwarzer C, Wieselthaler A, Sieghart W, Sperk G. GABA (A) receptors: Immunocytochemical distribution of 13 subunits in the adult rat brain. Neuroscience 2000;101:815-50. Allison C, Pratt JA, Ripley TL, Stephens DN. Alpha-amino-3-hydroxy-5-methylisoxazole-4-propionate receptor autoradiography in mouse brain after single and repeated withdrawal from diazepam. Eur J Neurosci 2005;21:1045-56. Xiang K, Tietz EI. Chronic benzodiazepine-induced reduction in GABA a receptor-mediated synaptic currents in hippocampal CA1 pyramidal neurons prevented by prior nimodipine injection. Neuroscience 2008;157:153-63. Bogunovic OJ, Greenfield SF. 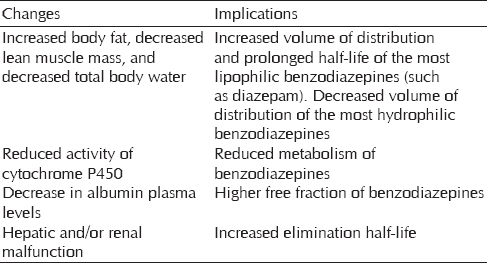 Practical geriatrics: Use of benzodiazepines among elderly patients. Psychiatr Serv 2004;55:233-5. Dowling GJ, Weiss SR, Condon TP. Drugs of abuse and the aging brain. Neuropsychopharmacology 2008;33:209-18. Griffin CE 3 rd , Kaye AM, Bueno FR, Kaye AD. Benzodiazepine pharmacology and central nervous system-mediated effects. Ochsner J 2013;13:214-23. Greenblatt DJ, Harmatz JS, Shader RI. Clinical pharmacokinetics of anxiolytics and hypnotics in the elderly. Therapeutic considerations (part I). Clin Pharmacokinet 1991;21:165-77. Greenblatt DJ, Harmatz JS, Shader RI. Clinical pharmacokinetics of anxiolytics and hypnotics in the elderly. Therapeutic considerations (part II). Clin Pharmacokinet 1991;21:262-73. Shorr RI, Robin DW. Rational use of benzodiazepines in the elderly. Drugs Aging 1994;4:9-20. Peppers MP. Benzodiazepines for alcohol withdrawal in the elderly and in patients with liver disease. Pharmacotherapy 1996;16:49-57. Cole JO, Chiarello RJ. The benzodiazepines as drugs of abuse. J Psychiatr Res 1990;24 Suppl 2:135-44. Longo LP, Johnson B. Addiction: Part I. Benzodiazepines - side effects, abuse risk and alternatives. Am Fam Physician 2000;61:2121-8. Licata SC, Rowlett JK. Abuse and dependence liability of benzodiazepine-type drugs: GABA (A) receptor modulation and beyond. Pharmacol Biochem Behav 2008;90:74-89. Pradel V, Delga C, Rouby F, Micallef J, Lapeyre-Mestre M. Assessment of abuse potential of benzodiazepines from a prescription database using ′doctor shopping′ as an indicator. CNS Drugs 2010;24:611-20. Griffiths RR, Wolf B. Relative abuse liability of different benzodiazepines in drug abusers. J Clin Psychopharmacol 1990;10:237-43. Kirby M, Denihan A, Bruce I, Radic A, Coakley D, Lawlor BA. Benzodiazepine use among the elderly in the community. Int J Geriatr Psychiatry 1999;14:280-4. Marra EM, Mazer-Amirshahi M, Brooks G, van den Anker J, May L, Pines JM, et al. Benzodiazepine prescribing in older adults in U.S. Ambulatory clinics and emergency departments (2001-10). J Am Geriatr Soc 2015;63:2074-81. Islam MM, Conigrave KM, Day CA, Nguyen Y, Haber PS. Twenty-year trends in benzodiazepine dispensing in the Australian population. Intern Med J 2014;44:57-64. Smith AJ, Tett SE. How do different age groups use benzodiazepines and antidepressants? Analysis of an Australian administrative database, 2003-6. Drugs Aging 2009;26:113-22. Kurko TA, Saastamoinen LK, Tähkäpää S, Tuulio-Henriksson A, Taiminen T, Tiihonen J, et al. Long-term use of benzodiazepines: Definitions, prevalence and usage patterns - A systematic review of register-based studies. Eur Psychiatry 2015;30:1037-47. Paterniti S, Dufouil C, Alpérovitch A. Long-term benzodiazepine use and cognitive decline in the elderly: The epidemiology of vascular aging study. J Clin Psychopharmacol 2002;22:285-93. Neutel CI, Skurtveit S, Berg C. What is the point of guidelines? Benzodiazepine and z-hypnotic use by an elderly population. Sleep Med 2012;13:893-7. Bourgeois J, Elseviers MM, Azermai M, Van Bortel L, Petrovic M, Vander Stichele RR. Benzodiazepine use in Belgian nursing homes: A closer look into indications and dosages. Eur J Clin Pharmacol 2012;68:833-44. Taipale HT, Bell JS, Uusi-Kokko M, Lönnroos E, Sulkava R, Hartikainen S. Sedative load among community-dwelling people aged 75 years and older: A population-based study. Drugs Aging 2011;28:913-25. Sahana DA, Pai K, Rajeshwari S, Ullal SD, Rathnakar UP, Jaykumar JS. Pattern of psychotropic drug usage in psychiatric illnesses among elderly. J Med Use Dev Ctries 2010;2:3-10. Sharan P, Bharadwaj R, Grover S, Padhy SK, Kumar V, Singh J. Dependence syndrome and intoxication delirium associated with zolpidem. Natl Med J India 2007;20:180-1. Sithamparanathan K, Sadera A, Leung L. Adverse effects of benzodiazepine use in elderly people: A meta-analysis. Asian J Gerontol Geriatr 2012;7:107-11. Drummer OH, Yap S. The involvement of prescribed drugs in road trauma. Forensic Sci Int 2016;265:17-21. Leufkens TR, Ramaekers JG, de Weerd AW, Riedel WJ, Vermeeren A. On-the-road driving performance and driving-related skills in older untreated insomnia patients and chronic users of hypnotics. Psychopharmacology (Berl) 2014;231:2851-65. Haddad PM, Dursun SM. 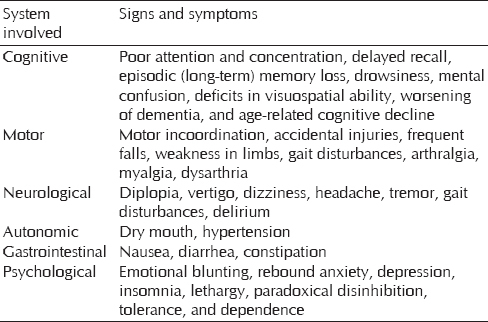 Neurological complications of psychiatric drugs: Clinical features and management. Hum Psychopharmacol 2008;23 Suppl 1:15-26. Kate NS, Pawar SS, Parkar SR, Sawant NS. Adverse drug reactions due to antipsychotics and sedative-hypnotics in the elderly. J Geriatr Ment Health 2015;2:16-29. Carlsten A, Waern M, Holmgren P, Allebeck P. The role of benzodiazepines in elderly suicides. Scand J Public Health 2003;31:224-8. Lahariya S, Grover S, Bagga S, Sharma A. Delirium in patients admitted to a cardiac intensive care unit with cardiac emergencies in a developing country: Incidence, prevalence, risk factor and outcome. Gen Hosp Psychiatry 2014;36:156-64. Glass J, Lanctôt KL, Herrmann N, Sproule BA, Busto UE. Sedative hypnotics in older people with insomnia: Meta-analysis of risks and benefits. BMJ 2005;331:1169. Hartikainen S, Lönnroos E, Louhivuori K. Medication as a risk factor for falls: Critical systematic review. J Gerontol A Biol Sci Med Sci 2007;62:1172-81. Barker MJ, Greenwood KM, Jackson M, Crowe SF. Cognitive effects of long-term benzodiazepine use: A meta-analysis. CNS Drugs 2004;18:37-48. Billioti de Gage S, Bégaud B, Bazin F, Verdoux H, Dartigues JF, Pérès K, et al. Benzodiazepine use and risk of dementia: Prospective population based study. BMJ 2012;345:e6231. Gray SL, Dublin S, Yu O, Walker R, Anderson M, Hubbard RA, et al. Benzodiazepine use and risk of incident dementia or cognitive decline: Prospective population based study. BMJ 2016;352:i90. Shash D, Kurth T, Bertrand M, Dufouil C, Barberger-Gateau P, Berr C, et al. Benzodiazepine, psychotropic medication, and dementia: A population-based cohort study. Alzheimers Dement 2015. pii: S1552-5260 (15) 02953-2. [EPub ahead of print]. Pariente A, de Gage SB, Moore N, Bégaud B. The benzodiazepine-dementia disorders link: Current state of knowledge. CNS Drugs 2016;30:1-7. Edwards JG, Cantopher T, Olivieri S. Benzodiazepine dependence and the problems of withdrawal. Postgrad Med J 1990;66 Suppl 2:S27-35. Schweizer E, Rickels K. Benzodiazepine dependence and withdrawal: A review of the syndrome and its clinical management. Acta Psychiatr Scand Suppl 1998;393:95-101. 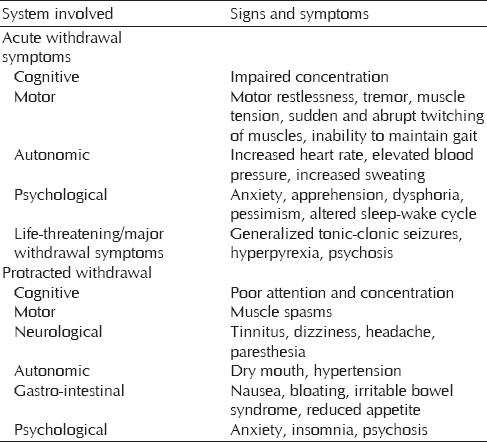 Ashton H. Protracted withdrawal syndromes from benzodiazepines. J Subst Abuse Treat 1991;8:19-28. Taylor D. Iatrogenic drug dependence - A problem in intensive care? Case study and literature review. Intensive Crit Care Nurs 1999;15:95-100. Sarkar S, Parmar A, Chatterjee B. Substance use disorders in the elderly: A review. J Geriatr Ment Health 2015;2:74-82. Blow FC, Barry KL. Alcohol and substance misuse in older adults. Curr Psychiatry Rep 2012;14:310-9. Humeniuk R, Ali R, Babor TF, Farrell M, Formigoni ML, Jittiwutikarn J, et al. Validation of the alcohol, smoking and substance involvement screening test (ASSIST). Addiction 2008;103:1039-47. Galarneau DW, Conrad EJ. 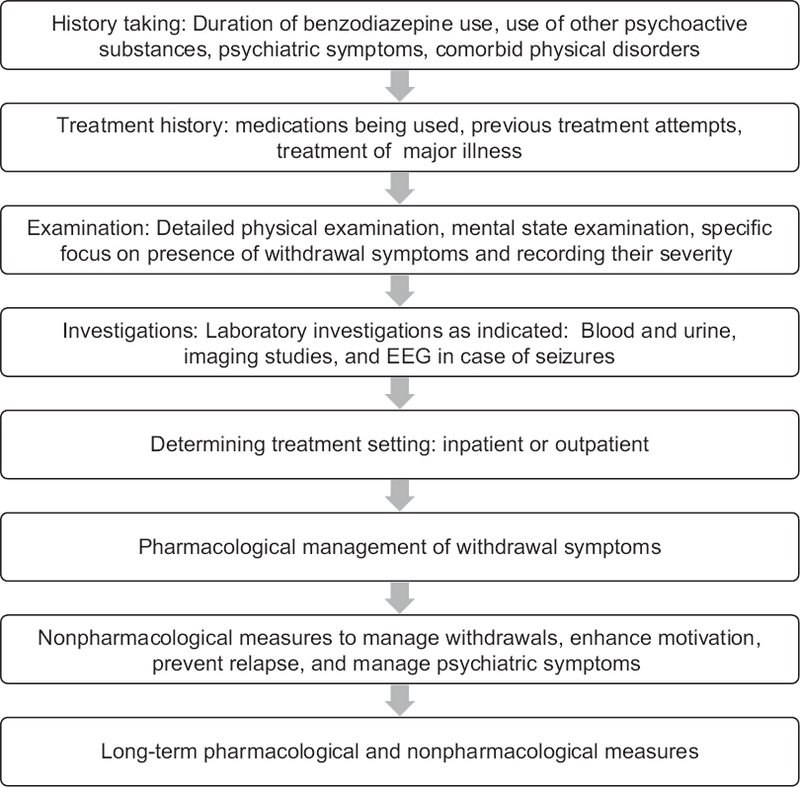 Benzodiazepine intoxication and withdrawal: Assessment and management. Hosp Med Clin 2015;4:513-25. Ashton H. The diagnosis and management of benzodiazepine dependence. Curr Opin Psychiatry 2005;18:249-55. Voshaar RC, Gorgels WJ, Mol AJ, van Balkom AJ, van de Lisdonk EH, Breteler MH, et al. Tapering off long-term benzodiazepine use with or without group cognitive-behavioural therapy: Three-condition, randomised controlled trial. Br J Psychiatry 2003;182:498-504. Lader M, Tylee A, Donoghue J. Withdrawing benzodiazepines in primary care. CNS Drugs 2009;23:19-34. Sabioni P, Bertram J, Le Foll B. Off-label use of medications for treatment of benzodiazepine use disorder. Curr Pharm Des 2015;21:3306-10. Ayers CR, Sorrell JT, Thorp SR, Wetherell JL. Evidence-based psychological treatments for late-life anxiety. Psychol Aging 2007;22:8-17. Buysse DJ, Germain A, Moul DE, Franzen PL, Brar LK, Fletcher ME, et al. Efficacy of brief behavioral treatment for chronic insomnia in older adults. Arch Intern Med 2011;171:887-95. Davidson JR, Zhang W, Connor KM, Ji J, Jobson K, Lecrubier Y, et al. A psychopharmacological treatment algorithm for generalised anxiety disorder (GAD). J Psychopharmacol 2010;24:3-26. Mitchell MD, Gehrman P, Perlis M, Umscheid CA. Comparative effectiveness of cognitive behavioral therapy for insomnia: A systematic review. BMC Fam Pract 2012;13:40. Sivertsen B, Omvik S, Pallesen S, Bjorvatn B, Havik OE, Kvale G, et al. Cognitive behavioral therapy vs zopiclone for treatment of chronic primary insomnia in older adults: A randomized controlled trial. JAMA 2006;295:2851-8. Bloom HG, Ahmed I, Alessi CA, Ancoli-Israel S, Buysse DJ, Kryger MH, et al. Evidence-based recommendations for the assessment and management of sleep disorders in older persons. J Am Geriatr Soc 2009;57:761-89. Johnson B. Drugs of abuse, sleep, and quality of life. In: Sleep and Quality of Life in Clinical Medicine. Humana Press, Totowa, NJ; 2008. p. 341-6. Available from: http://www.link.springer.com/chapter/10.1007/978-1-60327-343-5_35. [Last cited on 2016 Mar 15]. Schutte-Rodin S, Broch L, Buysse D, Dorsey C, Sateia M. Clinical guideline for the evaluation and management of chronic insomnia in adults. J Clin Sleep Med 2008;4:487-504. Tannenbaum C, Martin P, Tamblyn R, Benedetti A, Ahmed S. Reduction of inappropriate benzodiazepine prescriptions among older adults through direct patient education: The EMPOWER cluster randomized trial. JAMA Intern Med 2014;174:890-8. Gallagher P, Ryan C, Byrne S, Kennedy J, O′Mahony D. STOPP (screening tool of older person′s prescriptions) and START (screening tool to alert doctors to right treatment). Consensus validation. Int J Clin Pharmacol Ther 2008;46:72-83. Hill-Taylor B, Sketris I, Hayden J, Byrne S, O′Sullivan D, Christie R. Application of the STOPP/START criteria: A systematic review of the prevalence of potentially inappropriate prescribing in older adults, and evidence of clinical, humanistic and economic impact. J Clin Pharm Ther 2013;38:360-72. Lozano-Montoya I, Vélez-Diaz-Pallarés M, Delgado-Silveira E, Montero-Errasquin B, Cruz Jentoft AJ. Potentially inappropriate prescribing detected by STOPP-START criteria: Are they really inappropriate? Age Ageing 2015;44:861-6.